Published by Cyril Huze December 14th, 2016	in Builders, Editorial and Legal. Two Harley owners from Los Angeles County allege that the Twin Cam 103” engine equipping their motorcycles emit high heat, which can burn riders, and shorten the life of the engine. The plaintiffs allege that they suffered damages from purchasing Twin Cam 103″ equipped motorcycles and that Harley-Davidson is responsible because the defendants did not warn that the engine is defectively designed. They claim violation of the Unfair Competition Law and other counts and request a trial by jury, seeking an injunction against the defendants, ordering them to repair or replace the Twin Cam 103 engines, all legal fees and any other relief as the court deems just. The case is number 2:16-cv-08939 in U.S. District Court for the Central District of California. Sounds like a pant load of Buyers Remorse addled frivolous bs to me ! An air cooled engine might get hot? Who knew? Next they will probably sue someone that sold them hot coffee. These two clowns are the epitome of whats wrong with today’s society. What a bunch of Jabronis. One of them will probably become the next president. Sell Sell Sell…just sell it and we will deal with the issues later or a recall. If you have owned as many HDs as I have then you should/would know. You all are all to quick to call ’em out….If by chance any of you do own a Twin Cam 103 then you know first hand that they get excessively hot, especially in start/stop traffic (rear cylinder on or off) and summer weather, and will burn your inner thighs. Twin Cam 103 motors are excessively hot enough that I am looking at alternatives for my next bike, which will be this spring, or build me another one with plenty of room for air-flow between the gas tank and rocker boxes plus the rear cylinder. Get a life BOYS…..Now Git Real! I’m surprised no one has mentioned the 110″… they definitely suffer similar issues. A ThunderMax will help cool it off a bit… I haven’t had any experience with T/max Cali.compliant version though but they still state – Cooler, Smoother Running Engine!! Quit profiling,put it in gear,and RIDE IT! We can blame Russia for that too. Get Real…most here have owned them & part of an air cooled motor is it gets hot…..even the new precious Indians with their Thunderstroke 111….they get hot. That is why people have started an after market for different typed of heat shields to cover the rear cylinder by you leg & crotch for the Indian. The problem isn’t design. The problem is riders who refuse to embrace new technology but what more power & torque out of these motors. H-D 103 has been running hot since inception. Oil system is partially to blame. Fuel, spark, design and quality control are additional co-contributors. good thing I own a 96…..guess I’ll get a 107 instead of a 103 if I get a different bike. An air cooled motor sitting in LA traffic with thousands of cars around. A lawsuit? Craptacular. I’m pretty sure the argument here is that it gets hotter than an air cooled engine should. But, at the same time, twinkies running hot has been common knowledge for a very long time now and the more fairings on the bike the worse it is. Partly emissions controls and partly poor design of the oil system and airflow. Of course if it’s common knowledge why haven’t they fixed it yet? Who knows how this’ll end. Gas powered engines between your legs get hot? They should get an app (iOS or android) to get rid of the excessive heat. Or they could try and outsource it to China or the cloud. An air cooled motorcycle overheating in California traffic? Why would you sit in traffic? Keep moving, split lanes to keep air moving on your air cooled motorcycle. It’s an internal combustion engine!!!! Of course it gets hot! 103 gets real hot yes. Lawsuit no. When I got mine in 2012 I was stopped in traffic in Orlando on labor day weekend (very warm yes, real hot no) and mine did really over heat after about 10-15min. rear cylinder shut down and my leg did get burnt. I installed a Jag fan assist oil cooler and have not had a problem with that since, also the Thundermax helped a lot too. The bike does run real hot, could the factory have fixed it yes. there ends fact. Silly lawsuits like this should get thrown out and the they should have to pay the state for wasting their resources. Judge should force them to buy a gold wing. Out of all the design issues of the 103 this seems like the most frivolous. I own a sportster and the twin is junk! LOL ) and f**! these 2 idiots for suing the motor company. Its a combustion engine, you morons. It gets hot. If your not careful you get burned. Everything you buy has a design issue, otherwise it would all be perfect out of the box. I wonder what these 2 do for a living? Will all of you please think of the restrictions that have put on everyone who make an internal combustion engine by THE E.P.A. These restrictions among other things Restricts The Exhaust Flow. The longer the exhaust stays in the pipe and muffler the hotter they get. Changing the exhaust system on Harley Davidsons is one of the first things that people do and in most cases that makes the motorcycle run cooler and better. It is all over the news that Trump’s Transition Team is going to make serious changes at the EPA. This is a Perfect Time To Contact Your Elected Officials and Request That They Make Changes to the Current Laws Pertaining to Motorcycles. The fact that a motorcycle has an exposed engine and therefore exhaust system that goes back to the first ones built I doubt that a design flaw will hold much weight. Start with Getting Rid Of The Catalytic Converter and restrictive mufflers. This will greatly reduce the heat issue. Just for everyone’s general information the average lawn mower emits more pollutants than a motorcycle. As far as noise level that can be kept in tolerance. Please remember that the decibels from the exhaust are supposed to be checked at highway speeds. This is not how it is now being done. Sitting and revving an engine with no load on it produces louder decibels. Here is my comment and I can go deeper if needed. I’ve heard that the Milwaukee 8 runs pretty hot too. As far as saying it’s an air cooled motor, that’s what they do. I call BS. My Evo rarely gets hot enough to feel it through my jeans. It’s EPA rules, bad oiling, etc. But a reason for a lawsuit, HELL NO. Its like suing a prostitute, because she is too hot and she did not issue an advance warning, that her heat will make you spill some bodily fluids. FWIW, my Shovels weren’t hot either. ‘course they wouldn’t pass today’s kangaroo court EPA rules, either. Harley and their many “loyal” riders who promised to stop buying their bikes if they were all turned into V-Rods can all sit in a circle and blame the person to their left for this. Hopefully the incoming EPA head will finally state that CARB only applies to ONE State, and mfrs. will have the balls to stop shipping to CA. I live in northern Michigan and the reason I bought a new Road King last year it that it came with a heater as standard equipment!! Jeeeez your better off to sue Trump and Hillary for lying ………..where is Johnny Cocharoach when you need him!! Big thanks on that link. My Road King I bought new in 2000 is in the stages of melt down. A cam chest rebuild is the order, but in truth, i am going to sell it. Loved sportsters since forever. Now i have a reason to buy a Harley again. I like the idea of lighter, quicker bikes. They live in around LA, and they don’t like heat? I’ll trade. It’s 10 ° here, and wind blowing over the frozen snow. I’ll trade this for a little heat. Honestly, I have never had a comfort problem with any of these bikes that are supposed to be so hot. They oughta get an old Volkswagen. No heat there! 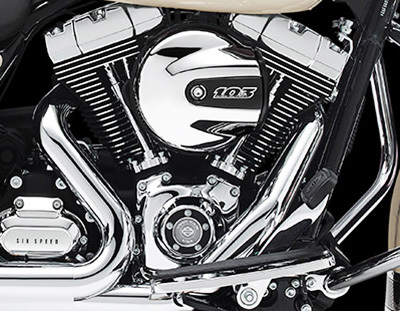 The “Milwaukee Eight” 107″ runs cooler… larger oil cooler, idols at 800 RPM instead of 1200 RPM… repositioned exhaust and motor to help the rear jug get more air flow. The 103 doesn’t get excessively hot in my opinion. Wear big boy pants not khaki shorts and your problem will go away. These guys are the same ones that complain of the “helmet buffeting”… it’s a motorcycle folks. Buy a Gold Wing… you can continue to wear your shorts. I have owned and presently own twin cam H-Ds and don’t consider myself to be more pain tolerant than others and I’ve not had any issues. They’re trying to make a buck. Some people just don’t get it. I have a yamaha Roadstar, its a 102Cu In V twin air cooled. Rear pipe in the stock setup is very close to the riders leg and I noticed heat when stuck in traffic for sure. I changed to a pipe that is similar to the HD’s and not near as hot. However you know the biggest change? I took the stock tank off and put a old School sporty tnak in the Frisco position. Heat cut to not much at all. The stock tanks are for fit over the engine and it holds in and down a massive amount of heat. I was stunned at the difference. Looking for some Partners and a Class Action Suit Pays real WELL! I guarantee they will have plenty of Bull shitters join in. My 2007 FLSTC got hot to, from the dealer to my garage. One set of cams, an oil cooler, and a GOOD tune later, problem solved!!! Did the same on a buddies 103, same thing, no problem! And no attorney either! So you made a lot of extra expenses to get the bike run like it should be in the first place when it came from the dealer? Would this not be a shame? Yeah, they run hot. That’s why you have to change the air/fuel mixture. You can’t do it on a stock bike. You have to get a Thundermax fuel injection module. When you buy one of these bikes, you ain;t done spending. You have got to delete the exhaust with a new, non-catalytic version, and change the module. It’s going to cost around $2,000. Just the way it is. Once you do this, you are good to go. They must inspect bikes in CA to make sure stock pipes are in place. Otherwise, the CA guys would have been all over this. If they want to sue – sue the EPA. Yes, the EPA that has made diesel engines in Chevy’s Ford’s and Dodge’s cost a fortune and last 1/3 as long as the pre-2008 versions. Harley ain’t got a choice if it wants to be in the bike business. You have to do what the EPA says. The fact the EPA gets a pass in all of this is a mystery. remap for A/F ratio is the best way to extend engine life and rider comfort. I’m back to riding an EVO which may get an S&S big bore 96″ kit. A Power Commander will fix it . Oops that would be illegal . Had A TC103B in a softail for 10 years no iseues. I ride in Florida gulf coast it ain’t cold. Is it hot at a stop light yep but not enough to burn or do motor damage. A lot of miles with no issues. I’ll buy a used one any day. There are ambulance chasing scumbag lawyers on every corner and plaintiffs with no sense of personal pride that will extort money from anyone they can that has deep pockets. These lowlifes knew what they purchased or didn’t do their homework before the purchase and were probably better candidates to be riding Chinese scooters. They are just looking for a big out of court settlement. What we need in this country is massive tort reform and a “loser pays” system, like in the UK. It’s makes the bottom feeding attorneys think twice before taking cases on a contingency. These guys need to man up and sell their Harleys and hopefully quit riding. Trump would call them pussies for sure! Buy some Love Jugs and ride!!! !